So... Step 1 done: Buying the plans. But I'm still struggling with the setup. I plan to add a last layer of veneer-strips to have the planking-look. Is it best to keep it as is, or is it better to use thinner plywood (4mm is not that uncommon)? Then the total is (4mm plywood + 3mm veneer) 7mm which is closer to the foreseen 6mm or 1/4 inch. Another question is the full setup of the layers. So as I see it now, the layers will be like this: Does that look okay? You only need to fiberglass the outside of the hull. It is for abrasion resistance and protects the epoxy encapsulation. Tom: You should still use 6mm for the side then use 3mm veneer boards. After fairing the veneer, you epoxy and fiberglass the outside only. The inside is epoxied for encapsulation, but not fiberglassed. When I did my malahini, I miss understood what others have done and used 3mm and 4mm to make the sides about 7mm. I have since been told this is incorrect. I haven't figured out what to do, but I'm considering adding another layer of 3mm ply to the inside once I flip my boat. Exactly the answers I was looking for. Stick to the 3+6 and only glass fiber outside with epoxy overall. 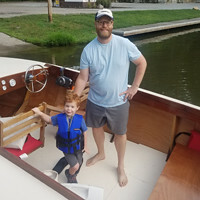 I considered this approach with my Squirt, and just keep in mind with 1/8" veneer that you will be adding considerable weight to a small boat. I was able to use 1/42" thick veneer and add very little weight to my Squirt. I also considered using 1/8" plywood and 1/8" veneer, but Glen warned against this since the thinner plywood would not bend properly around the frames. Isn't working with 1/42 much more difficult? Then I come to an extra weight of about 20kg. I don't think it will be 10m², but indeed 20kg is already a serious load, but not really catastrophic. I guess? I don't mind putting a thinner layer; I just took 1/8 because that's what I found browsing the web. The idea with the thin veneers is that you do all your "sanding away your errors" on the plywood. Here you can use epoxy and fillers and get a nice smooth hull, and then the veneer covers all of that, but it won't give you much to sand away. The problem with thin veneers is that you need a good method to bond them to the hull. I used a vacuum bagging setup which worked great. You could also apply the veneer to the plywood before applying it to the frame, but then you need to hide screws and you would have to fair the surface with clear epoxy. According to the Glen L specs on the Squirt, the hull is supposed to weigh 120lbs. Adding 20kg (44lbs) is increasing the weight by 1/3. This is significant and will affect how it floats and the performance. One possible option would be to go with 1/8" plywood and bond the 1/8" mahogany to it before it is applied to the frame. This might bend properly, but also it might be stressing the veneer plywood glue joint. I don't know of anyone here who has attempted this. When I was researching my Squirt, I was told no one sees the sides since it sits low in the water so don't bother with them. There have been a lot of squirts with just stained/painted plywood sides and cool decks. A lot will depend on what resources you have and how much time you want to spend on it. That all are indeed nice ideas. I can ask the local veneer shop to make me ply with mahogany-decking, but then again the joint of 2 boards of ply will still be noticeable, and that's just the thing that I don't want . Also the screws need to be hidden then. I think I'm just gonna start building with 1/4 ply and when the plywood is finished, I'll see if I put on a thick layer, a thin layer or no layer of veneer. Depending on how long it will take to get there and how good I will be in getting there, I can still choose. But I still prefer a planked look, even it's barely visible in the water. Check out Art's Squirt build here http://artatkinson.blogspot.com/ to see how he handled it. I've already been looking to his blog. Very helpful! Thanks again for this nice tip!